Perhaps your little one aspires to be an astronaut when she or he grows up. Maybe they fancy themselves as a heavyweight boxing champ. It’s possible they want to be a doctor or a lawyer when they’re older. But some kids, even from a young age, just want to collect. When I was at primary school, my best friend collected notes. Of serial numbers. He was a trainspotter. When I was older, I had friends that collected Panini World Cup stickers. Others collected Garbage Pail Kids cards – remember those? Probably not. I briefly collected coins as a child. Then I collected albums. Nowadays, I enjoy collecting musical instruments. Who knows what it is about collecting? I guess some of us – many of us, as a matter of fact –see something of interest in our subject, something beautiful, something unique. And then we want to enjoy accumulating examples, enjoying their variety, their craftsmanship, their content, design, shape, color, tone and size. Once you begin to admire something, there becomes an ever-increasing value to that thing, evermore to discover and enjoy. For kids, who are especially observant and fascinated individuals, there are lots of great things out there that will spark an interest, even a love affair. There are just so many. Pretty dolls, mean-looking soldiers, fantastical creatures, favorite cartoon characters…. You can arrange them, paint them, even saw bit off and glue other bits on. Figurines are a fantastic gift for children of all kinds and ages. They can organised their figurines into battle formation, they can sit them atop book shelves or in glass cabinets. They can place them in dynamic poses, have them facing north, south, east or west. They can give them names, place them in groups, look after them, treasure them, one day even pass them on. Or sell them. Give them 3 of 3 to get them going. 3 classic Batmans, 3 classic Supermans, 3 classic Spider-Mans. Now that’s a gift that will just keep on giving. Not only will it introduce them to some of fiction’s most memorable heroes, it will get them reading, imagining and falling in love, not only with the stories and characters, but the artwork and art of storytelling. Video games get a bad rap from parents. They’re not educational. They’re violent. They should be reading. They should be playing – with wheels and a stick or something. Well whatever you think they should or shouldn’t be doing, please explain, what’s wrong with building a collection of the coolest-looking, cleverest-written, most contemporary and – most crucially – most fun collect-able goodies you can get your hands on? Who doesn’t love a good marble? 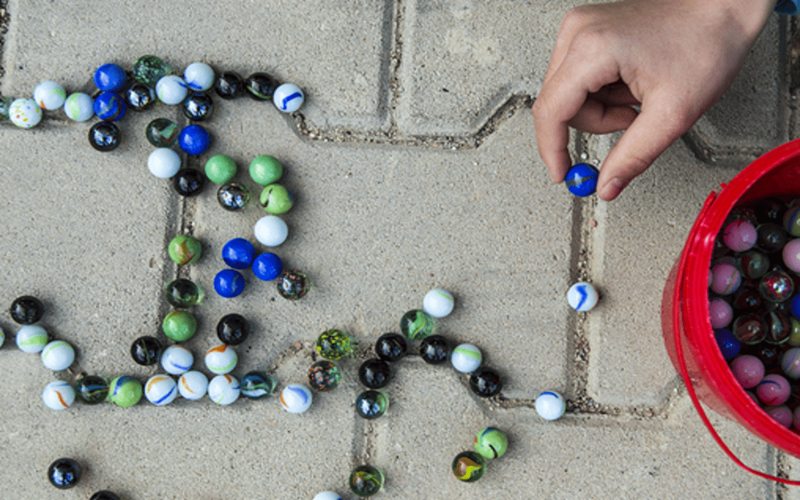 For whatever reason, marbles are endlessly fascinating objects. No child can ever refuse a good-looking marble, and nor should they. Fun to play with, fun to look at, and fun to clank around in a hat, sock, purse or bag. Ever studied the intricate colours and patterns of an opal? Some specimens are so beautiful, it’s like staring into another universe. How about a slice of tourmaline? Its translucent hues of pink, green and blue will transfix. Or perhaps the rose-red of rhodochrosite will captivate your youthful audience? Rocks offer not only a window into the world of science, but into the world itself. Rock colours, forms and sizes will marvel, but they will also provoke inquiry and encourage investigation into their formation and origin, just as they will into the Earth’s deepest past – and future. People often think of collections as pastimes for the obsessive, whereas in fact they represent fantastic opportunities to see and discover what’s special in the world about us.